Webcam Sodus Point, New York: Sodus Bay Lighthouse & Museum - A webcam in Sodus Point, New York - camera location: Sodus Bay Lighthouse & Museum. Palmyra, New York: Yellow Mills Road, 20.3 mi. Webster, New York: Webster F.D. Station 1, 22.8 mi. Port Byron, New York: Port Byron Central School, 24.4 mi. Fairport, New York: Weathercam, 24.8 mi. Webster, New York: Forest Lawn Beach on Lake Ontario, 26.1 mi. Pittsford, New York: Weathercam, 28 mi. Pittsford, New York: CinchLink Webcam, 28.1 mi. Rochester, New York: Seabreeze Amusement Park, 28.1 mi. 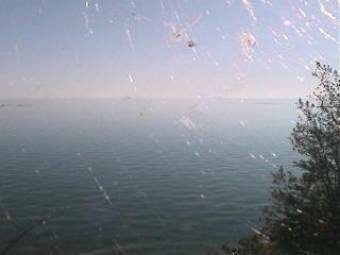 This webcam Sodus Point, New York with the theme Seaview was added on September 13, 2010 and is operated by WeatherBug. It got 9355 visitors since then. Shouldn't this webcam work or should the link be wrong please report that here. You can add this webcam here to myCams.